Here we are going to see how to use equations to solve problems about area of rectangles, parallelograms, trapezoids, and triangles? Write the formula to find the area of the given shape. By using the inverse operations, we can find the the unknown. After winning the state tournament, the wrestling team hangs a pennant shaped like a triangle on the gym wall. The base of the triangle is 1.5 feet long. It has an area of 2.25 square feet. 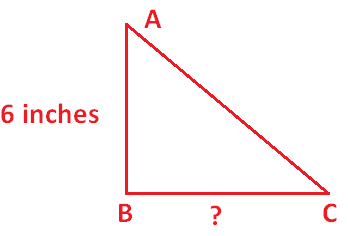 What is the height of the triangle? Renee is sewing a quilt whose pattern contains right triangles. Each quilt piece is a right triangle with a height of 6 inches, and an area of 24 square inches. How long is the base of each quilt piece? Each quilt piece is in the shape right triangles. A parallelogram shaped field in a park needs sod. The parallelogram has a base of 21.5 meters and a height of 18 meters. The sod is sold in pallets of 50 square meters. How many pallets of sod are needed to fill the field? The sod is sold in pallets of 50 square meters. Hence 8 pallets are needed to fill the field. Taylor wants to paint his rectangular deck that is 42 feet long and 28 feet wide. A gallon of paint covers about 350 square feet. How many gallons of paint will Taylor need to cover the entire deck? A gallon of paint covers about 350 square feet. Hence, Taylor will need 4 gallons of paint to cover the entire deck. Let us see the next example on "Solving area equations"
A triangular bandana has an area of 70 square inches. The height of the triangle is 8 inches. Write and solve an equation to find the length of the base of the triangle. After having gone through the stuff given above, we hope that the students would have understood "Solving area equations".